There were not many surprises on the last big stakes program for harness racing this year, held on the Meadowlands’ second week of the current meet, which was also week two of its grand opening with a new facility and reversed racetrack. But we were on top of the only true outsider win, which took place in the Final Four fall finals. Our choice in the Valley Victory, Muscles Network, won and paid $17. That wasn’t all we offered in the stakes race, since we nailed the exacta with Nuncio at $42.20 and the triple with Southwind Spirit third, paying $107.60. Though she won the Goldsmith Maid and we did not attempt to beat her, Shake It Cerry paid only $2.10, $2.10, no show betting). Three other events found us second, with Arthur Blue Chip ($3.20, $3.20) in the Governor’s Cup, Act Now ($6.40, $3.40) in the Three Diamonds, and Ma Chere Hall ($2.80, no show betting) in the Moni Maker. Captaintreacherous did not fare well against the older pacers, finishing sixth to Foiled Again (pictured above from Meadowlands). Modern Legend, our other outsider possibility, ended his bid one spot in front of the great sophomore. Arch Madness was fourth in the FFA trot, won by the top choice, Market Share, who we chose behind him (no credit for us), paying $4.60 . Sunshine Beach, the huge choice at Dover on Dec. 1, won the Progress Pace ahead of a 78-1 shot, with our choice, Dedi’s Dragon, third. The horses-to-watch (H2W) list last week was abbreviated due to the Thanksgiving holiday and a large number of horses that were poised to take their second shot on the list unavailable to race. This left us without horses at our usually covered tracks, including the Meadows, Batavia, Freehold and Pompano. Also, Pocono closed, leaving many of the Pennsylvania stock heading for Philadelphia in the coming weeks. With the stakes season over, our year-ending blogs will consist of more tracks covered on the H2W list, as well as some feature races around North America at various raceways. 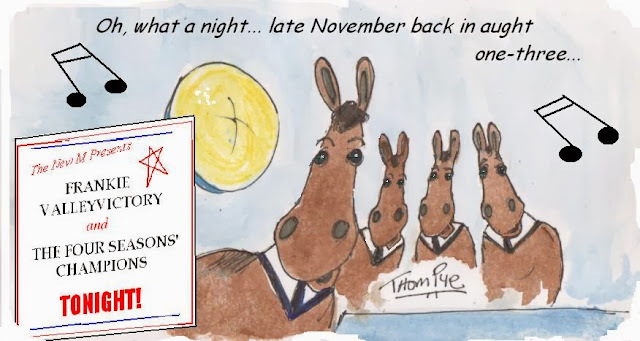 In other words, there is plenty of action left in 2013, so keep those TwinSpires accounts ready to take advantage of the overnight parade of potential winners we will concentrate on presenting. Dover Downs’ defending driver champion, Corey Callahan, came up with his biggest night of the meet driving seven winners on Nov.26. He also had six losers on the night, two of them favorites, one at 5-2 and the others promising double digits. The flat-bet profit on Corey for the program was $14. However, that was due to one horse winning that paid $16.20. The other six winners for Corey paid $2.80 to $6.80. Once again, a leading driver at a track only makes a profit due to an anomaly. Further evidence of a lack in importance of specific driver participation in betting took place at the new Meadowlands on Nov. 29. John Campbell won four of 10 mounts with a high price of $18.80. He was a flat-bet investment of $20. His other winners’ prices helped produce a profit of $18.80, the anomaly of the quartet. As well, Billy Dobson had six wins at Saratoga on Nov. 27 for a flat-bet profit of $16.60 with a $22 investment. Dobson had to have two winners at $10 each to accomplish less than Campbell earned with one less mount. Great drivers’ news is that Cat Manzi returned to the bike after recuperating from a bad accident at Freehold in September. He won his fifth drive back at Freehold and donated the day’s earnings to a fund for Anthony Coletta, who is still in a coma from an accident at Philadelphia. After the win, the buzz for Foiled Again’s final 2013 achievement, which would be to win the Horse of the Year ballot, was loud and clear. Even though Bee A Magician won her 17th-straight race as a sophomore and because Captaintreacherous’ loss against Foiled Again will not help him get any more votes, Foiled Again went right to the top as the favorite to win the coveted title. 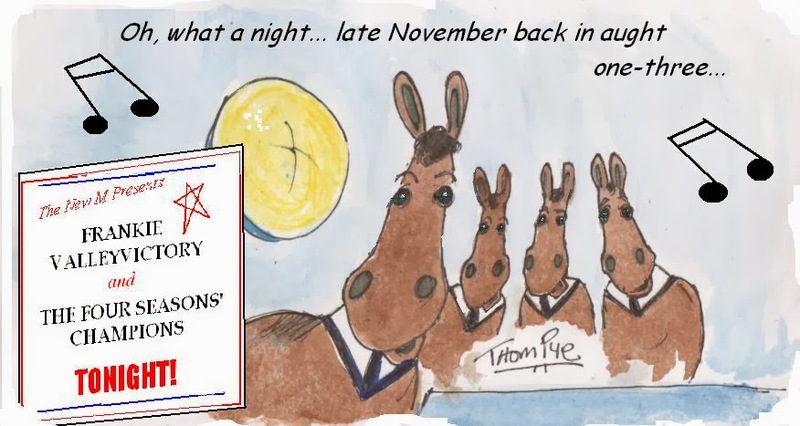 We will report on the voting (in which we participate) but as we have done at this corner for years we will be reporting on our own horse of the year, based on the prices winners have been treated to through our blogs over the past 12 months. Don’t miss one edition of our twice-weekly TwinSpires harness blog, the exclusive and only blog for harness racing bettors.